This week’s #playfulpreschool theme contains activities centered around a HARVEST THEME! 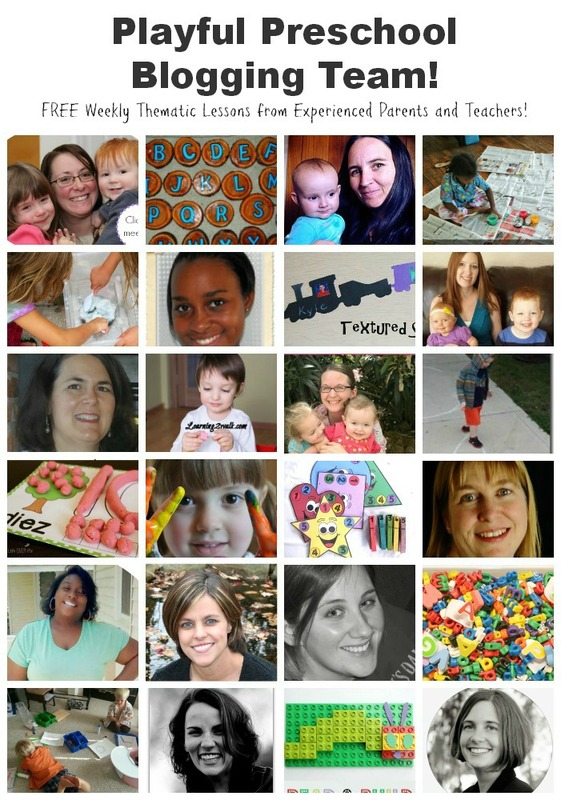 All throughout the school year, the Playful Preschool blogging team will be working behind the scenes to offer activities and suggestions just for your students or children. Please visit the home page of this blog each Wednesday morning to see new theme-based ideas for playful learning! 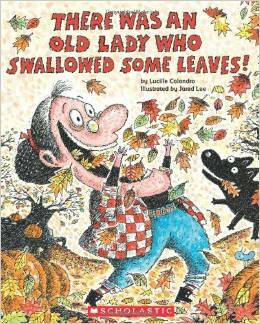 There Was An Old Lady Who Swallowed Some Leaves by Lucille Colandro is one of our favorite harvest books. It is meant to be read with a good dose of humor as the old lady swallows the various items. Your kids will love reading (and SNEEZING) until the harvest surprise comes at the end of the story! It’s a FUN book for fall/harvest themes at home or in the classroom! Purpose: To encourage kids to higher level thinking strategies when listening to a book. 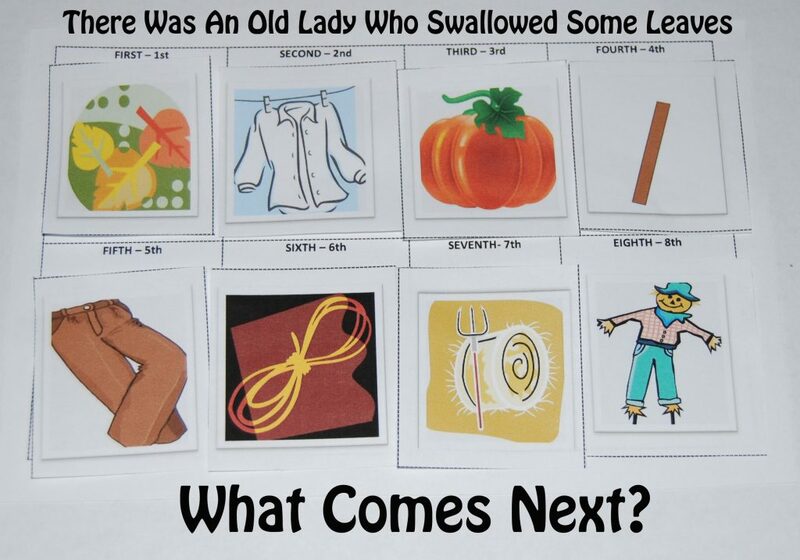 Before reading There Was An Old Lady Who Swallowed Some Leaves, have the children make verbal predictions about what they think the story is about. Invite the children to look at the book cover (front and back) then write down all the predictions the children give. While reading, stop several times and ask the children again what they think is happening in the book. The answers will differ slightly from the predictions at the beginning. Did any of the children predict what the end character would be in the story? Prediction is a great strategy for engaging preschoolers in the story as well as encouraging them to think about what the author is doing through the text and how the book will end. Materials needed: one story timeline printable (linked here – There Was An Old Lady Story Timeline, scissors, and glue sticks. Invite the children to cut out the cards and sequence the cards in the blank boxes according to the story’s timeline of events. What item was introduced first, second, third, and so on. After the children are finished with the activity, read the book again and pause to note when each of the objects are introduced. The kids will have fun following along and will often shout-out the next object that will appear in the story! Some preschoolers may not know that the character at the end of the story is a SCARECROW. A scarecrow gets its name from the duty it performs; a scarecrow is designed to SCARE away crows (or other birds) from a field or a garden to keep the birds from eating the harvest fruits or vegetables. To extend the book and help the children sequence the events of the story, the children can create stick puppets to hold up as the story is read. Materials needed: One printable ( There Was An Old Lady Who Swallowed Some Leaves), glue sticks, scissors, and wooden craft sticks. Print the sequencing cards and have the children cut out each card. The children can then glue the individual picture cards to craft sticks to create their own stick puppets. Invite the children to lay the stick puppets in front of them as the story is read. As each item appears in the story, have the children locate and hold up the corresponding stick puppet. The children might also use their stick puppets as they watch the PowerPoint below! Materials needed: heavy paper (any color for the shirt/pants), twine or yarn (rope), hay or raffia, leaf stickers or leaf confetti, seasonal straws or wooden craft sticks (pole), poster putty, markers, and miniature craft pumpkins (head). Prior to the activity – cut out a basic shirt/pants from any color of heavy paper and set aside. Discuss all of the items on the table with the children. Invite the children to feel the different textures and try describing how the items FEEL. Help the children increase vocabulary skills by exploring various descriptive words (for example: bumpy, shiny, smooth, scratchy, sticky, gooey, and crunchy). To make the textured scarecrow puppets: Have the children tear small pieces of poster putty to attach the craft leaves to the paper shirt – adhere the paper shirt/leaves to the seasonal straws with additional poster putty. Invite the children to draw facial features on the miniature craft pumpkins with the marker. The pumpkin can then be attached to the straw with poster putty. The children can add the pants, raffia/twine, and hay to complete the stick puppet. Read the story again and ask the children to point out the puppet parts as they appear in the story. 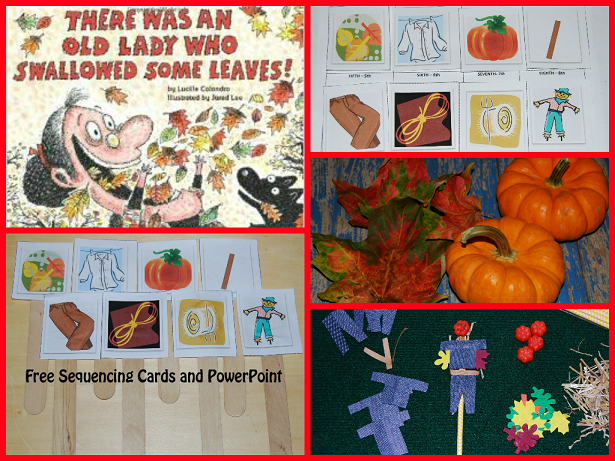 There Was An Old Lady Who Swallowed Some Leaves is a fun book to read for a Harvest Theme in Preschool! The kids will have fun sequencing the story and playing with the created puppets while making predictions about what character the items will make at the end of the story! We have this book too… I need to bring out my fall stash and find it! Amanda – I had forgotten about it too, until organizing before school started. It’s a fun one! Thanks for your comment! What a wonderful collection of activities to go along with the book. I can’t wait to try them out with our preschoolers. 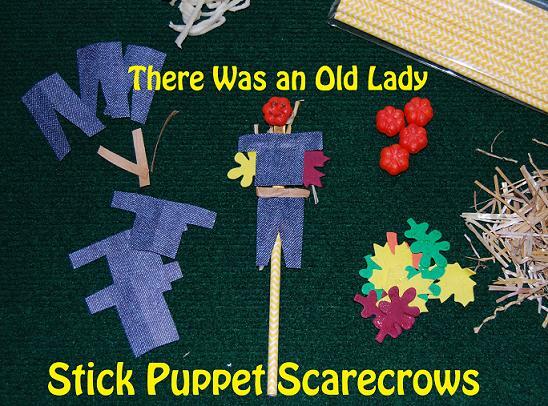 The stick scarecrow puppets are a fun craft. Our little ones are fascinated by scarecrows lately so this would definitely pique their interest. Theresa – it’s a silly and fun book to read – the extension activities encourage real engagement! I hope your kids like it as much as ours do! Great post! I love the sequencing cards and how you use them while reading the story. Such a good idea! Danielle – thanks for taking the time to visit! The sequencing cards are fun and the kids catch on quickly! Nicolette – well, good! It’s a fun one to use during the fall and harvest time! What a fun book. I like the stick puppets! Jodie – the stick puppets are fun to make. It encourages a bit of vocabulary, too! Thanks for visiting. What a great way to dive deeper into literature! Devany – 🙂 Thanks so much for visiting and your comment! I can just imagine the conversation that a bunch of preschoolers could have while talking about the scarecrows. I think we will give this book and the stick scarecrows a try to bring up some conversation. Natasha – hope YOUR kids like it, too! Thank you for your comment! I love the look of the book – we’ve never read any of the Lady who swallowed a books but do sing the song. What a great stick puppet as well. Cerys – they are fun to read this time of the year! Thanks for visiting and your comment! One of our favorite books for fall. I love the idea of sequencing cards! Sarah – thanks so much for visiting! 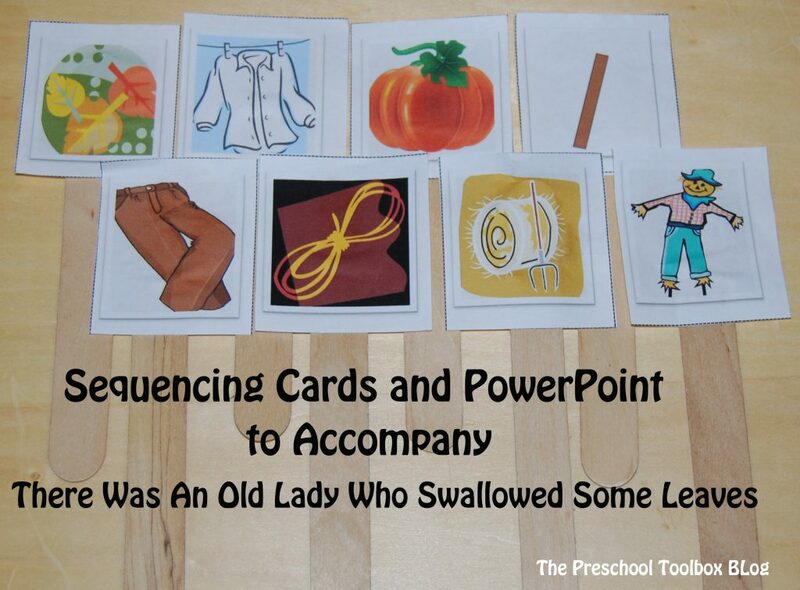 Sequencing cards are a fun way to extend this book – they’re FUN, too! Have a great weekend! Such fun activities to accompany a super fun book! We love it, too! Thanks for your comment, Kim! What great activities and ideas. My students will love the book and the activities. Thank you so much!